Most houses settle over time as the foundation sinks into the ground bit by bit. This is normal but can lead to a variety of problems, both inside and outside of the home. 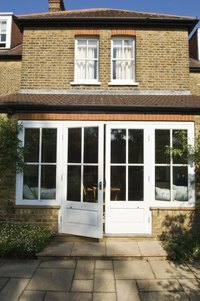 One of the most common problems associated with settling foundations is that doors will develop a tendency to stick or not close properly. It's possible to fix these tricky doors with a few hand tools and some basic maintenance to the door frame and hardware. Open and close the door to see where the door is sticking. It may stick on the top or bottom of the door. Mark the general area where the door is sticking with a pencil. Place the end of a flat head screwdriver against the bottom of the hinge pins. Gently tap the end of the screwdriver with a hammer to loosen the pins. Pull all of the pins out. Pull the door off the hinges and set it on a work table. Place a block plane on the outside edge of the door nearest to where you marked the problem area. Firmly push the plane toward the center of the door to shave off a small amount of wood. After each pass, hang the door on the hinges and close it to test the fit. Repeat the shaving and hanging process until the door opens and closes smoothly. Cover the shaved end of the door with a layer of primer paint to seal the wood. Tighten all of the screws inside the door hinges. Loose screws will often exacerbate a sticking door problem. Always shave off door material from the outside edge of the door toward the middle to avoid splitting the wood. How Much Settling Is Normal in a House?